If I talked about the 3pm crash and snack craving, it wouldn’t be the first time you heard it from me. I often find myself tired and approaching headache-land around 3pm. What I typically need is a little snack — a little burst of protein to fuel me on to cook dinner. 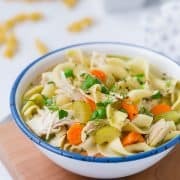 It’s a great snack for the whole family and I would totally make it for a dinner as well. It’s hearty enough thanks to the cheese and pepperoni — pair it with a salad and you’re all set. 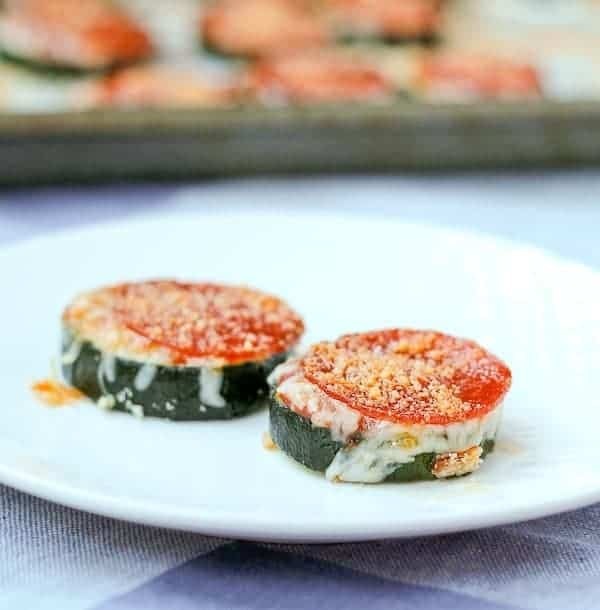 They’re easy to make — give the zucchini a bit of a head start by broiling it in your oven. You could also grill or sauté it but I’m all about minimizing the dirty pans. ….and broil for another minute or two and you’re all set! Hope you love this fun snack as much as we do! 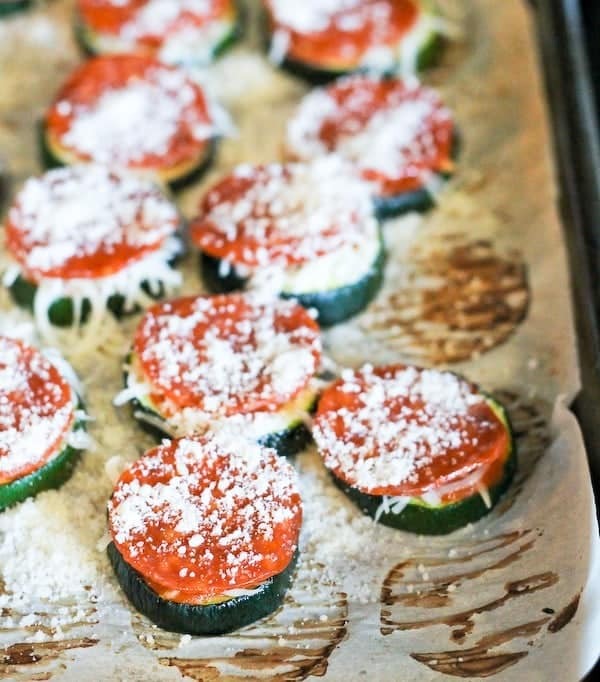 Place zucchini slices on a parchment paper-lined baking sheet. Spray tops lightly with nonstick cooking spray. Place under the broiler for 3-5 minutes or until golden brown. Flip and broil again for 2-3 minutes or until browning on second side. 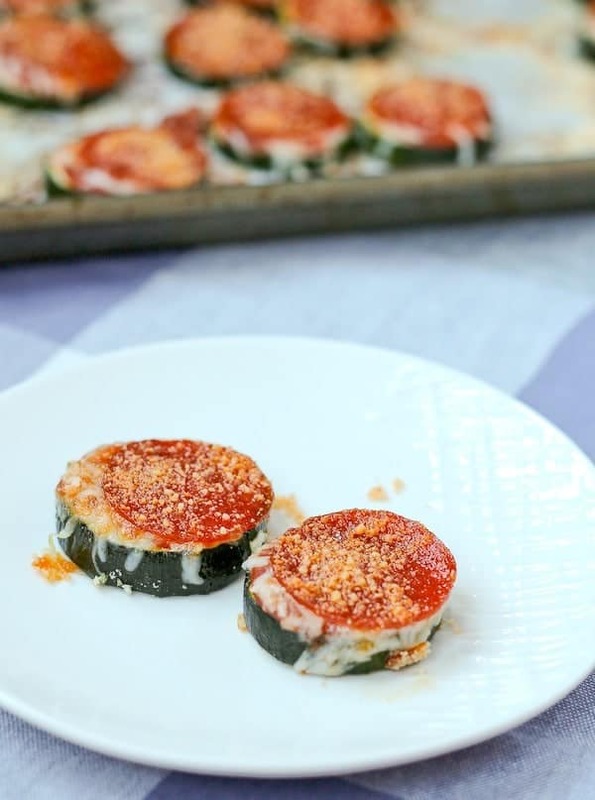 Remove from oven and carefully top with sauce, mozzarella cheese, one pepperoni per mini pizza, and finally with Parmesan cheese. Return to oven and broil for 1-2 minutes or until cheese is melted and bubbling. Verdict: I loved these! I will definitely be making them frequently. Husband’s take: Ben loved these as did E. Nathan, as always, didn’t try them. Changes I would make: None are necessary, but if pepperoni isn’t your thing, try out your favorite pizza toppings. 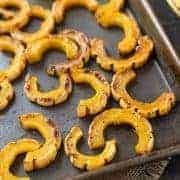 If you’re looking for more pizza-themed recipes try parmesan crusted pepperoni pizza grilled cheese, pepperoni pizza lasagna rolls, pizza quinoa stuffed peppers, pizza chicken tenders, or pizza mac and cheese muffins. I’m also loving this low-carb Cauliflower-Crust Vegetarian Pizza Recipe from Kalyn’s Kitchen! I’ve made pizza lasagna out of zucchini noodles, and it was BOMB. BUT, it took ALL THE YEARS to make. 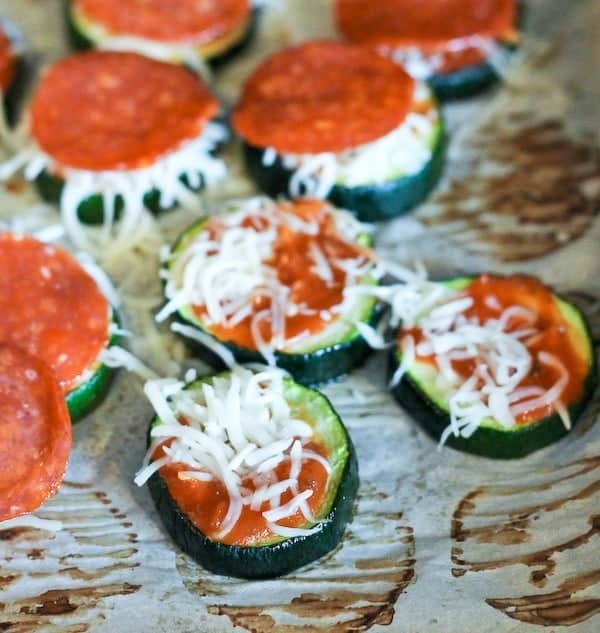 I love your little snack version….healthy pizza goodness, yes please! Pinned! 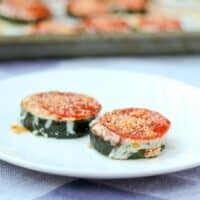 What a fabulous, healthier pizza treat! I could eat oodles of these delicious nibbles! These are so stinkin’ clever! 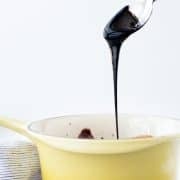 I can’t wait to make this recipe. Pinned. My mouth is literally watering right now! Can’t wait to try this! I love Zucchini pizzas! Can’t wait to make them again! I don’t know who would love these more – me or my kids!!! Great idea – I’ve got to try this with my picky eater! 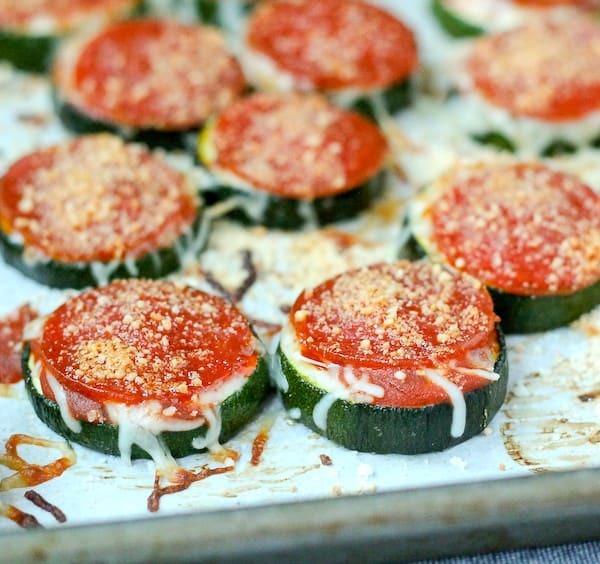 She won’t willingly eat zucchini either – but made into a pizza…just maybe! What?!!! Great idea, seriously. And it looks so good! What a fun after-school snack! Definitely making these soon! This is so fun! I’m totally trying it soon! I absolutely love this snack!! No guilt pizza! I love the way every one gets its own piece of pepperoni; looks great!